The Guernsey climate is amongst the mildest and sunniest in the whole of the British Isles, being warmed by the adjacent Gulf Stream. Every year, the island of Guernsey enjoys up to 2,000 hours of sunny weather, with the hottest months being from May to October. During the summer months, the weather is not only sunny, with average daytime temperatures of anywhere between 20°C / 68°F and 25°C / 77°F, but also extremely dry. April, May and June tend to be the driest months on Guernsey, when precipitation levels rarely top 120 mm / 4.7 inches for this entire period. 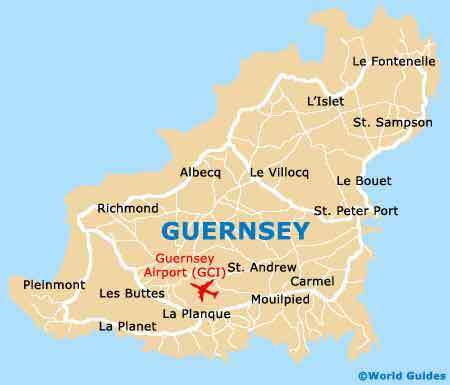 You will be extremely unlucky if you visit Guernsey in July and August and the climate is not favourable and sunny. Many days at this time of the year experience sun from first thing in the morning, right up to the end of the day, meaning that sunscreen is quite essential. This perfect weather results in visitors flocking to Guernsey's beaches, to soak up the sun and paddle in the sea. Gentle sea breezes can make even the summer evenings of Guernsey feel a little cooler on occasion and a light jacket may by necessary if you're eating outside. The maritime climate is especially mild in the winter months, with many subtropical palms and exotic plants thriving in this environment. November and December tend to be the wettest and cloudiest months on Guernsey, although this rainy weather is far from extreme and each month only sees around 95 mm / 3.7 inches.